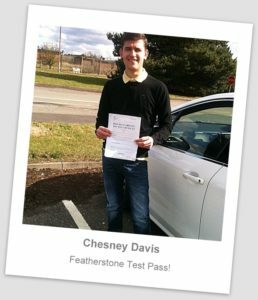 Driving Lessons Walsall | Driving Test Success for Chesney! Driving Lessons Walsall, Driving Test Success for Chesney! Do you need a driving school in Walsall? Congratulations to Chesney Davis from Walsall on passing his driving test at Featherstone at the first attempt! Chesney is now able to enjoy his independence driving his Renault Clio. Congratulations and safe driving from Neil Parkes at Prodrive Driving School. Driving Lessons Cannock, Driving Test Success for Wanch! Driving Lessons Bloxwich, First Time Pass for Eileen! Driving Lessons Cannock, Driving Test Success for Phil!